If you have an opinion on whether Carl Icahn or Bill Ackman got the better of today&apos;s amazing CNBC shoutfest over Herbalife, you have a number of options for expressing it. We&apos;ve had like four posts so, y&apos;know, comment away, but if you want something more formal both CNBC and Business Insider have polls you can vote on. Also if you listen to CNBC&apos;s video you can hear in the background a bunch of men who, when not oohing and ahhing over cursing on television, spend their days running around pretending to trade stocks. Don&apos;t be fooled, though: you can actually trade stocks, even Herbalife&apos;s. If Icahn-Ackmania changed your view of Ackman&apos;s short thesis on Herbalife, feel free to express that changed view with money. This makes sense - as a former high school debate judge I&apos;d score this one for Ackman too. On style alone: Icahn apparently did his interview in a zen garden surrounded by a team of silent and efficient researchers; Icahn prepped by going to a Queens schoolyard and getting in fights. Who cares if Ackman is a crying Jewish boy?5 Who cares if Icahn is a hypocrite? Who cares who wanted to be friends with whom when? 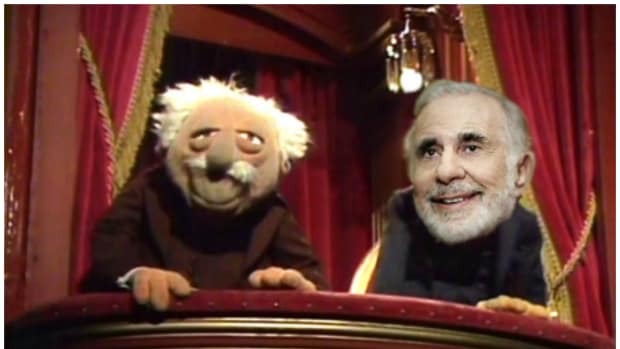 Ackman and Icahn, obviously, but that&apos;s about it. People have argued that whatever Icahn-Ackmania is, it&apos;s not about Herbalife any more, and I guess that&apos;s true. But it makes me sort of sad. It&apos;s so cynical! Ackman has hundreds of millions of dollars of his investors&apos;, and his own, and his favorite charity&apos;s money on his Herbalife bet. Icahn ... unclear what his P&L angle is here, he may be running purely on grudge. Still, what is going on? I don&apos;t know. There&apos;s a small class of investors whose position-taking is partially self-fulfilling: Warren Buffett buys a stock and it goes up; David Einhorn shorts it and it goes down. This magic works if it&apos;s used sparingly; like Facebook, if you try too aggressively to monetize it it loses its charm. You gotta keep being right. If you’re [long | short], you go [long | short] and hey, if it goes [up | down] you make money. If not, your name becomes less useful to conjure with. Ackman and Icahn both belong to that class; Herbalife&apos;s stock price path - drop on Ackman&apos;s short, pop on Icahn&apos;s rumored long - demonstrates as much. And when you&apos;re in that class - and have even, now and again, profited from it - it&apos;s easy to confuse the power of your track record with the power of your personality. "If I can make a stock move just by disclosing my position, imagine what I could do by shouting about it on CNBC." Less than you&apos;d think, it turns out. Earlier:How Should Bill Ackman And Carl Icahn Settle This Thing Once And For All? 2.Rumored yes, he won&apos;t confirm or deny - ESPECIALLY NOT TO CNBC. Who cares, honestly, who cares. The meaning has shifted in English usage from being an aggressor to being a fool or loser, Glasser said in a telephone interview. “The insurance is you won’t be a victim,” he said. The concept is more universal than Yiddish, a language with roots in German and used by Eastern European Jews and, with diminished frequency, their descendants. The British equivalent is “anti-embarrassment clause,” said Camille Douglas, an adjunct associate professor at the Columbia Business School in New York and a specialist in international real estate finance. 4.Quick recap: Icahn bought ~80% of CVR for $30 plus a promise that if the company was acquired within fifteen months (viz. by fall 2013) for more than $30, he&apos;d give the cashed-out shareholders the upside on their shares above $30. (100% of the upside - not 50% as he did with Ackman in Hallwood.) I have a pet theory that, unlike in Hallwood, Icahn&apos;s CVR document is (badly) drafted to require him to pay the upside even if he acquires the rest of the company, and that that may help explain why he withdrew his mid-2012 offer to do just that. How does that theory fit with the Hallwood precedent? What if he bought the rest of the company and just told the shareholders he&apos;d see them in court? "I know what I meant, I don&apos;t care what the contract says." Etc. 5.Icahn really did say that. Just FYI. We&apos;re all Jews here though so it&apos;s okay. Henry Winkler once said, "Assumptions are the termites of relationships. "1 In 2011, Bill Ackman assumed it was okay to talk to The New York Times about David Einhorn's business and, like a homeowner forced to move out for three days while a pest control company sprays the place, he's been forced to pay for it, big time. Oh Carl, why do you hide your love away? How Should Bill Ackman And Carl Icahn Settle This Thing Once And For All? When Mark Hughs founded a multi-level marketing company called Herbalife in 1980, he probably thought it had the power to do a lot of things. Help people lose weight. Makes others rich. Shake up the diet industry. What he mostly likely did not expect, however, was that his li'l company that could would reignite a feud between two billionaires that would devolve into a flurry of press releases quibbling over who was dying to be friends with whom, shouting matches on live TV, and, we predict, someone telling someone else he has a right mind to "Rip the eyes out of your head and piss into your dead skull! You messed with the wrong hedge fund manager!"